Hundreds of years ago astronomers noticed a nebula with a most unusual shape that is now known as M57 or NGC 6720, the gas cloud roughly 500 times the diameter of our Solar System popularly known as the Ring Nebula – a planetary nebula, a gas cloud emitted at the end of a Sun-like star's existence. 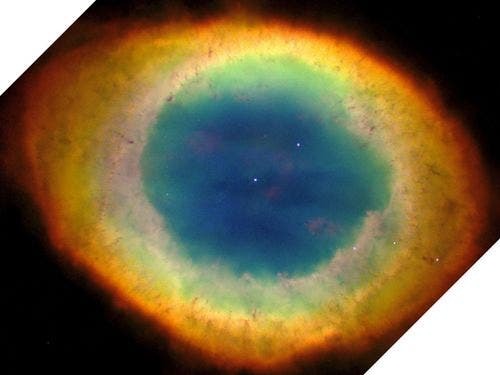 As one of the brightest planetary nebula on the sky, the Ring Nebula can be seen with a small telescope . The Ring lies about 4,000 light years away in the constellation of Lyra. In this image by the Hubble Space Telescope, dust filaments and globules are visible far from the central star, indicating that the Ring Nebula is not spherical, but cylindrical. 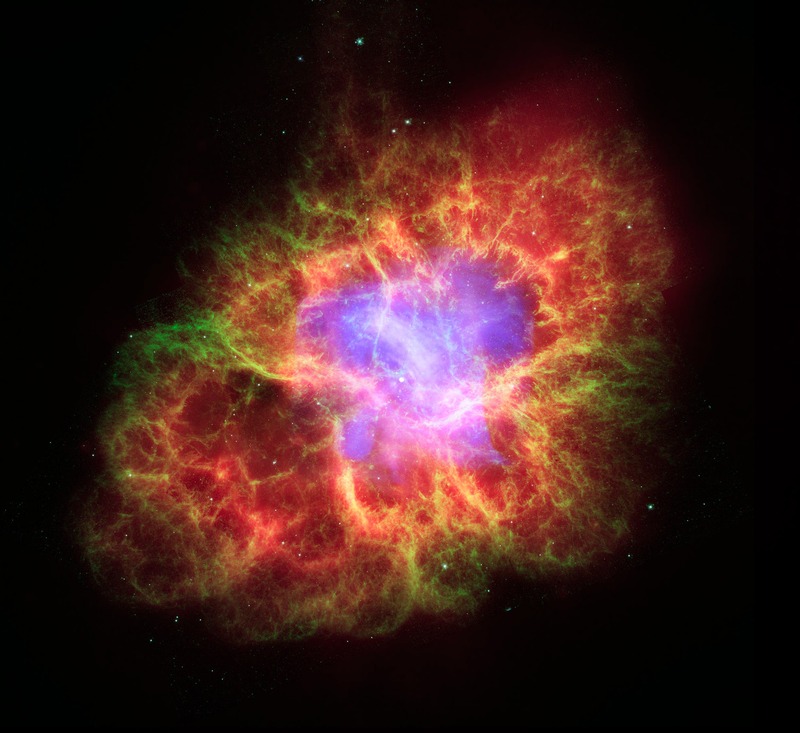 In 2007, a public vote took place in Stockholm for the ten most spectacular supernovas, with the SN 1054 Crab Nebula (below), with its stunning pulsar, the hands down winner. Runner-up Geminga (image below), the gamma-ray pulsar, which means "it's not there" in Italian, is a sort of neutron star: the decaying core of a behemoth star that went supernova about 300,000 years ago and must have given our primitive ancestors quite a scare. Most pulsars emit radio waves. Yet Geminga is "radio quiet" — a peculiar object discovered 30 years ago as a "gamma-ray only" source. 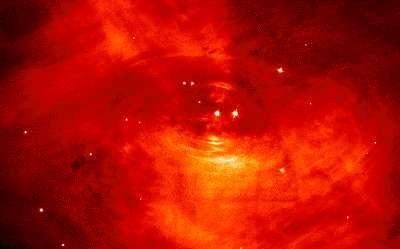 (Geminga has since been detected in the X-ray and optical light wavebands.) Through processes not fully understood, Geminga is the second-brightest gamma-ray object in the sky. Geminga generates this highest-energy form of light by accelerating electrons and positrons, a type of antimatter, to high speeds as it spins like a dynamo four times per second. Geminga's X-ray tails are the latest discovery. Moving so swiftly through space, Geminga creates a shock wave that both compresses the gas in the interstellar medium and boosts Geminga's magnetic field by a factor of four. Geminga can serve as an interstellar probe.The brightness and thickness of the X-ray tails are a measure of the density of matter in between stars, the vast regions darkness that remain largely unmeasured. The intensity and angle of the tails confirm earlier measurements of Geminga's proper motion, velocity, radius, and mass from optical observations. In addition, this observation of Geminga with an X-ray observatory may provide clues to the nature of unknown gamma-ray sources. Of the 271 higher-energy gamma-ray objects detected by a NASA telescope called EGRET, 170 remained unidentified in other wavebands. These unidentified objects about be "gamma-ray pulsars" like Geminga, whose optical and X-ray light might only be visible because of its nearness to Earth.